I know Forum Moderators get custom forum profile avatars, but why can't we? It would help distinguish players easily from each other, plus it makes having an account on the Forums more worthwhile. Having something like this would be great. What do you guys think? I think this is a great idea. To demonstrate, I wasted my time doing up two examples of changes that I personally thought could be beneficial. CMs could of course with my blessings still have gifs as their icons which would still set them apart. But giving everyone else the ability to stop being faceless nobodies would certainly brighten things up around here. Let's take a look. As we can see, User uploaded icons add just a touch of actual personality behind posts. In addition to this, having the ability to write about who you are in game also makes it so making friends off the forum is much easier-plus it gets rid of there being way too much anonymity here-which we all know what happens when a forum is completely anon, dont we CM. Then! I'm not sure if images are allowed in signatures or not but if they're not then that might be nice as well. But I think they might already be able to exist. I'm not sure there-will have to fiddle with that later. Now, let's take a look further. So, current user profiles are just as faceless as what we see on the front side of the forum. But with just a few changes, it will almost now appears like we players are actual human beings! 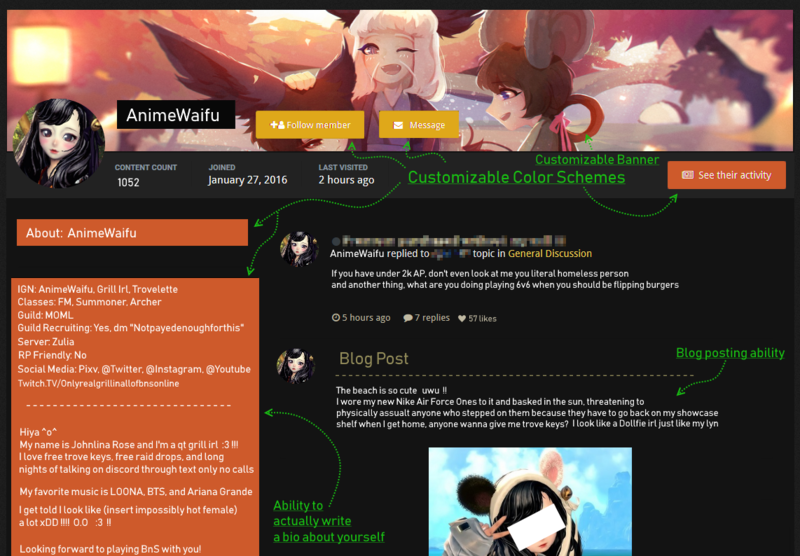 Customizable color schemes, banners, another spot to write a little about yourself (which right now that current spot is just oddly blank as if that was its original intention but never panned out), plus some other things other than just forum posts visible to other users from this page. This again encourages creativity, game immersion, and a sense of sharing with your game community which creates a closeness that makes it much harder to simply leave after being one shot and then disconnected during a 6v6 match. In actuality, these are very very minimal changes, but sometimes, it's the little things that leave a much bigger and long lasting impression. The more freedom you allow your customers, the happier they might possibly be. And there are no downsides to happy customers. Let's get those smiles started. My humble opinion is to have the forums for feedback of things good and in need of suggestions. I'd rather have social stuff in-game, but we're lacking that. Unless the customizations would be heavily limited and controlled i'd rather we not have customized forum profiles. If you look at what garbage and outright disgusting pictures people upload on their game profiles.....I dred to think what would happen here. I'd settle for just not being locked into a genero jinf face. I don't need to see 12394203 different avatars or signatures. They don't matter to me. Forum is nice, clean and easily readable like it is currently. Specially with Article 13 on its way, they probably won't do it anyway as 99,99999% of all avatars are not done by the user that has it. Hi! We answered to that question several times in the past and letting everyone to choose the avatar they want on forums is a route we will never take. We've all seen what can happen on F2 Profile pictures in-game already, I would like to avoid our Moderators chasing up after inappropriate avatars/signatures all day long, not to mention that forums are readable technically by anyone (including non-authenticated users) meaning that there's no age gating in place, so all content published in here must be completely safe for work (we are even more strict than we are in-game here). Let's not mention all the drama related to art theft that we would have to deal with too. Our initial goal when we launched forums was to directly integrate in-game data so your avatar would be representing your character in-game (like WoW basically), as well as pulling basic settings such as your level, clan etc. That was unfortunately never put in place. The alternative we are looking at is to have an avatar gallery. 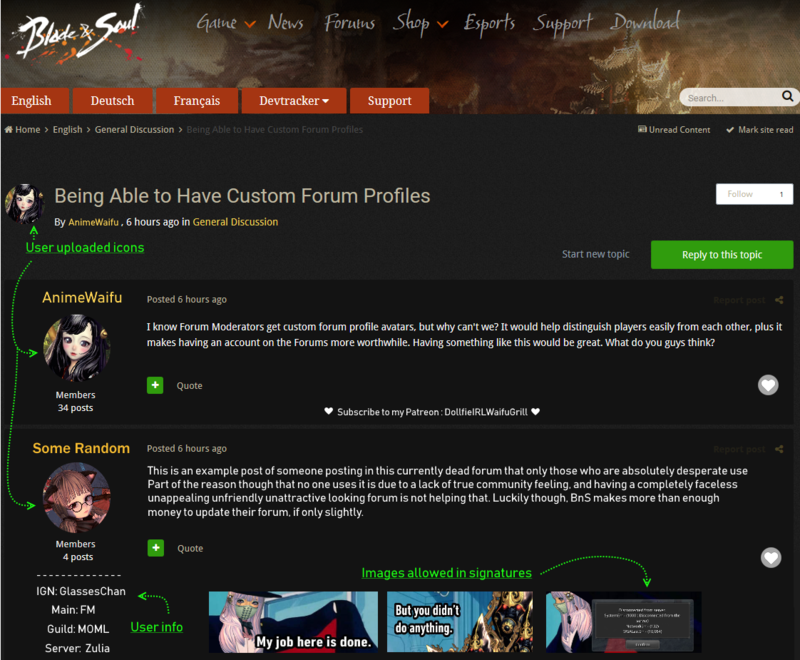 It's something we will be able to do once Blade & Soul forums gets upgraded (right now the functionality isn't present in the current version of the forum software we are using). Once that feature is in, adding a bunch of pre-determined avatars for everyone to choose from will be easy! Great mock up also Showta, thank you for taking the time to make that! The alternative we are looking at is to have an avatar gallery. It's something we will be able to do once Blade & Soul forums gets upgraded (right now the functionality isn't present in the current version of the forum software we are using). Once that feature is in, adding a bunch of pre-determined avatars for everyone to choose from will be easy! Please! I have been wanting exactly this since the forums were first setup! I don't care about full custom avatars. All I want is to be able to choose something different. And this is exactly how most mmo forums I've been to have done it. Plenty of forums don't allow to setup your avatars, but have a galleries of avatars to choose from, which is welcome. Sorry for my poor English, not my mother language. Thank you, King. Graphic Design is my passion. The Art Theft dramu thing is right, that's real, true true...a point was made. Or even if we still say No to banners, what about being able to change color templates at least? The most beneficial though would without a doubt be ah...having players be able to write and display who they are in-game as well as maaaaaybe where to find their content. There are so many Blade and Soul artists and people who do very detailed guide videos and streamers who dedicate hours of their day every day inviting newbies to tag along or happily explain content to them. I understand completely though that that also does open the "well what if they link something foul" window, so I mean, it does make it a little tricky. What if their media link requires an approval first? I don't know. I just wish BnS content wasnt as scattered as it is. I've done pastebins for BnS which really puts into perspective both how confusing the game itself can be for newbies along with how confusing it is for them to find current reliable sources without having to scavenge the internet for 2 or 3 days. Reddit is of no use, naturally. I associate with trash on a daily basis and even we're more civilized than that. So all that leaves is the main site/forum for a big hub of information which is kindaaaaaaaaaaa not too great. An avatar gallery is a lot better than everyone being the same, so I can appreciate that. Any idea on when the upgrade might come? I'm just being nosy at this point. Basically, I'm just hoping for something-anything really, that sets us apart from having too much anonymity. There's already Reddit for whining and naming calling and there was already bnsg for the exact same thing which ate itself completely and I'm quite tired of coming to the official forum and pretty much seeing a 3rd version of the exact same thing. and no Twitter doesnt take the place because I'm an adult and the last thing I want is for other adults I actually know in real life to know what I do when I get home. Regarding anything creative, things can be shared directly on the Fan Creations forums, that's probably the best avenue for that. Art can also be tweeted to us, we will like/RT some of it as well (we obviously cannot like or RT just about everything). When it comes to guides or useful resources for the Community, we got that thread (which is a bit outdated, but we can dust that off! ), feel free to link your pastebin to me and I'll be able to add them there too. I am not extremely keen on having banners on forums / signatures. Keeping the place as readable as possible is our first priority, even if it may look a bit stale. Regarding colour template/design anyone is just free to make their custom CSS and use an extension like Stylish or Stylus. If someone comes up with something amazing I wouldn't even mind sharing it publicly but it will have to remain something "unofficial" through an extension. For brand image reasons we have to keep the default design as it is, it's not something we can change on a whim. (However if you feel that something is difficult to read due to a bad colour scheme, as long as it's something minor it's an adjustment I can make instantly). Regarding the Avatar Gallery and forum upgrade, I just asked the team in charge again today for an ETA. It's a feature we know works since we have it on another NCSOFT title forums, so all we need is to deploy that update on Blade & Soul forums. One last suggestion I can think up would be...maybe in the future, to breathe more life into the forum other than just "I hate NCsoft, they never do anything right, dead game, my entire life is now ruined over one mistake in an update and now I demand compensation in the form of having both my tuition paid and all of my medical bills because that update left me quadriplegic" -to maybe get some moods ooooooooother than spicy anger going on here, maybe host a dinky Screenshot contest or something. Winner doesnt have to get a brand new car, just chuck em a free appearance change voucher or something. That would be very nice. I don't mind you using this thread as a base @Showta; go right ahead. Also, great job with this explanation and illustrative demonstrations. I only hope that our voice is heard. Include profile avatars, and the forums become more lively @Youmukon. This is something that the community will like, and it would give more of a reason to commit to using the forums as a feedback, social, and sharing space. From my experience, custom avatars can get out of hand. I manage the forums for a gaming community, and I know what it's like dealing with custom profile avatars. It's annoying, unnecessary, and can be very inappropriate. This is why I would suggest continuing along the plans of having custom profile avatars, a lot of them for variety, from Blade & Soul that the players must choose from; don't give us the option to freely-customize our profile avatar because that won't end well. When it comes to guides or useful resources for the Community, we got that thread (which is a bit outdated, but we can dust that off! ), feel free to link your pastebin to me and I'll be able to add them there too. But some is probably outdated and also not the most accurate in the entire world-like I'm pretty sure someone else can do a way better job but if it helps in any way then there it is. Anyone can do whatever they want with it, I don't mind. Use bits, take, reword, use to make own paste/better version, etc etc etc-whatever's useful out of it feel free to use in any way at all. I am but a humble servant ok goodnight. I'm still supporting and waiting on this to happen. Please make this happen, so that the Forums becomes more community-friendly and has more personality.